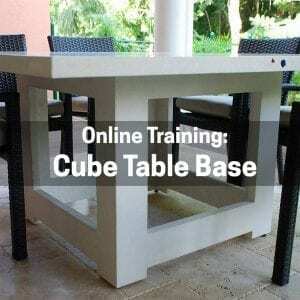 Get detailed instructions and cut sheets to create this striking, 3-dimensional cube table base out of GFRC. These plans are extremely detailed, step by step instructions that take all the guesswork out of constructing a 3-D table base form. You’ll also get instant online access to a 1-hour video, which gives important tips for using GFRC to make the table base and also great information about polishing and sealing it. Please note: Prior GFRC knowledge is assumed.